Habitat loss and fragmentation is another important reason why tigers disappearing. Without a safe and healthy home for tigers and their prey, neither can survive in the wild. 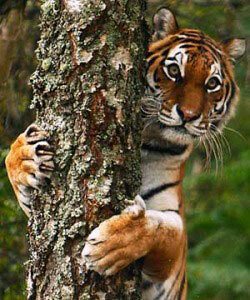 Humans are rapidly encroaching into wilderness areas that were once ruled exclusively by the tiger. In India, which is home to over one third of the world’s wild tigers, the human population has exceeded one billion inhabitants. As tigers compete with humans for land, they find less and less to eat. Local people hunt the same prey as tigers do, pressing tigers to resort to domestic animals and, on rarer occasions, even humans. This makes them unpopular with villagers. Threatened villagers often poison, shoot, or snare the encroaching tigers. In addition to food, local communities also need to use the surrounding patches of forest area for livestock grazing and wood for fuel. Without wilderness, the wild tiger will not survive. Admit it – the words ‘superb creature’ don’t do justice to the tiger! 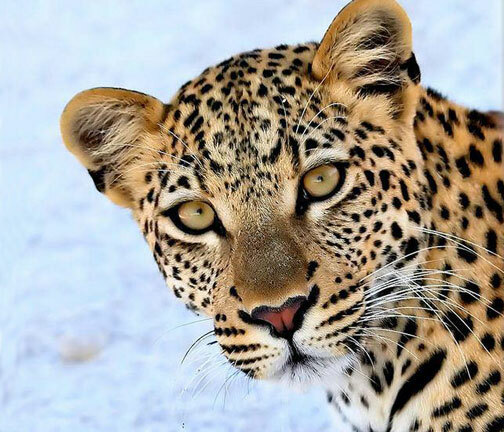 The big cat is revered, admired and feared in equal parts, by millions of people around the world. If forests are emptied of every last tiger, all that will remain are distant legends, zoo sightings, and one massive breach of trust. Can we really say we loved everything about the tiger, except its existence? Tigers are endangered mainly from poachers. Poachers are people who hunt illegally. There used to be 100,000 tigers in Asia alone and now there are only 4,000 tigers left around the whole world. Poachers even hunt in parks where some tigers live. Some people will pay 65,000 dollars for 1 tiger skin. So that is basically why tigers are endangered, and maybe if we try hard enough we can get them back. The mighty tiger has become a symbol in our culture of strength, beauty and agility. One day it could become a symbol of humankind’s reckless destruction. There were nine subspecies of tiger in the world: the Siberian tiger, the South China tiger, Indochinese tiger, the Sumatran tiger, the Bengal tiger, the Malayan tiger, the Balinese tiger, the Javan tiger, and the Caspian tiger or Persian tiger. According to the website www.tigersincrisis.com, Tigers increasingly compete with an expanding human population and industry for land and food, and many are killed by poachers who sell their skins and body parts as ingredients for traditional Chinese medicines. Even though it is illegal to kill a tiger, wild tigers are still being poached today because their bones, whiskers and other body parts can be sold for a lot of money. Because of tiger’s strength and mythical powers that the tiger has medicinal qualities which helps treat chronic ailments, cure diseases and replenish body’s energy. The use of tiger parts in traditional Chinese medicines is a very old and very expensive practice. But in the recent years the increase in living standards has made these remedies more available to most people. There is a huge demand for parts of tigers in the Asian market, which has led to sharp increase in their prices causing further increase in poaching activities by greedy hunters and traders. Fortunately, there are natural alternatives for those seeking traditional Chinese medicines to treat ailments and diseases without using tiger’s derivatives. Since 1900, the endangered tiger’s habitat and numbers have been reduced by up to 95 percent. Poachers continue to poison waterholes or set steel wire snares to kill tigers and tiger prey. The number of tigers in the 1900s — over 100,000 — dropped to 4,000 in the 1970s. Today, they are a critically endangered species with the total of all the wild populations of the five remaining subspecies (Bengal tigers, IndoChinese tigers, Siberian tigers, South China tigers, and Sumatran tigers) an estimated 4,600 and 7,700 tigers. Tigers are on top of the food chain in an ecosystem. Therefore, monitoring the health of the tiger is an excellent way to monitor the health of the entire ecosystem. If the tiger is doing well, the ecosystem it lives in is doing well. However, if the tiger is dwindling, the ecosystem it belongs to is under serious threat. (This is, however, relevant to tigers in the wild. 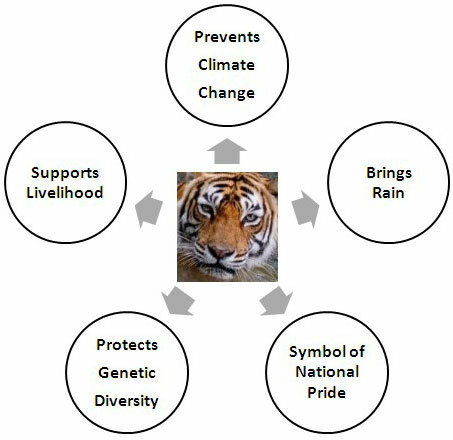 *Healthy tiger populations = healthy ecosystems. As a large predator, the tiger plays a key role in maintaining healthy ecosystems. These ecosystems supply both nature and people with fresh water, food, and many other vital services – which means by saving the tiger, we are helping people too. *Tigers can directly help some of the world’s poorest communities. For one thing, where tigers exist, tourists go. And where tourists go, communities can make money with few alternatives for making a living. *Tiger conservation projects also help provide other alternative livelihoods for rural communities, that are not only more sustainable but which can raise income levels too. All remaining tigers live in small, isolated populations in widely scattered reserves. Unlike lions, leopards and cheetahs, tigers prefer to live in densely covered land where they can hide in tall grasses, camouflaged by their dark stripes, and ambush their prey. With humans growing their footprint exponentially across the earth, including lands critical to the tigers’ survival, these densely covered brush areas are increasingly being wiped out. We at GreenDustries believe that we can help endangered species like the tiger only through multi-level cooperation among governments and groups of concerned people. 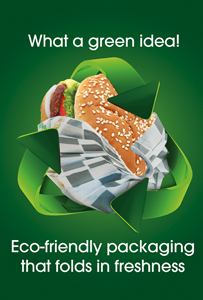 Green doesn’t only refer to the earth but also to all those that live on it: animals and people. Of those two groups it’s the animals that deserve attention. They didn’t create the problem but they’re the ones that seem to be suffering the most.